How Did Teenagers Dress in the 80s? 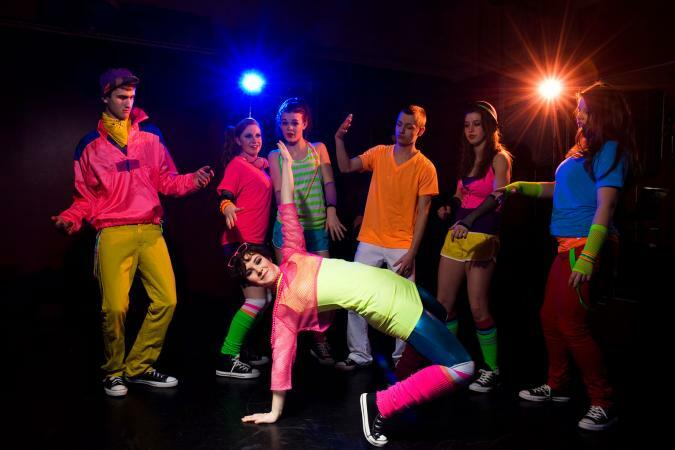 Do you ever find yourself wondering, "How did teenagers dress in the '80s?" The 1980s are often looked at as a time of crazy fashion when fashion icons like Madonna, Jennifer Beal's character in Flashdance and club trends reigned supreme. During this decade, more elevated fashion by designers who are still iconoclastic like Calvin Klein, Ralph Lauren and Giorgio Armani also came to a precipice. These designers became popular largely due to their casual, "street" styles. More casual clothing like jean jackets, stonewash, and oversized wear. Denim became more popular with designers who put more relaxed denim on runways and store models. The denim jean jacket became the quintessential accessory of the decade and many teens found the look comfortable and weather friendly. Stonewashed denim blends became available in more styles, such as the relaxed boyfriend fit that rose in popularity over the decade. Teens in the 1980s also started the trend of wearing ripped or faded denim blues. Unlike later decades, however, these styles were are all self-made rather than purchased at the store. Teens would just take razor blades to the knees of their jeans and 'scuff' them up. One of the larger color trends of the decade was going as big and bright as possible. Neon colors like purple, pink and green were not only popular as colors that someone would dye his or her hair! Clothing came in a wide cornucopia of patterns and colors, and it was common to see plaid designs using these colors. Bright colors meshed well with other form styles of the decade such as jelly jewelry, which often came in the brightest colors under the sun. 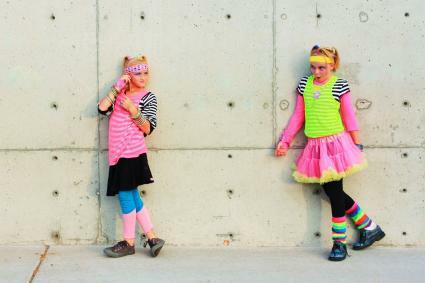 What Did Girls Wear in the 80s? Teen fashion for girls was at its height in the 80s. 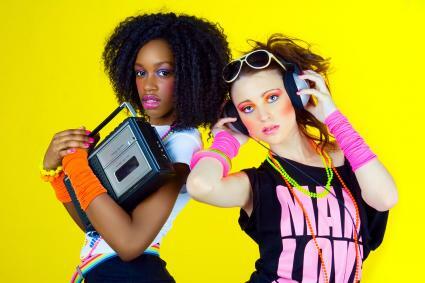 Not only did the 80s have big hair and colorful makeup but the styles for girls followed suit. Jelly was a transparent, plastic material that rose to popularity. The style was most known for its shoe stylings as well as thick bracelets and bubbly necklaces. Jelly shoes were often called Jellies and frequently were flat and supportive to the arc of a woman's foot. 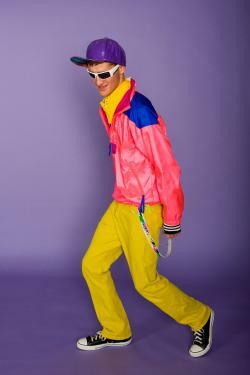 It also frequently came in bright neon colors to accommodate other 1980s trends. If you're wondering, "How did teenagers dress in the 80s? ", the answer can largely be found in the movie Flashdance. In the film, the main character is frequently working out. Her style became a marker for teens of the era. Styles like cotton workout headbands, legwarmers, wristbands, oversized sweaters that had the neck stretched out to only fit on one shoulder and spandex all became acceptable clothing choices for teens. Tight leggings and sneakers helped to complete the ensemble. You know those tight and colored pant-like tights that teens in the 2000s wear under just-too-short dresses? In the 1980s, leggings were first developed as part of popular style garb. Often in bright colors, it was acceptable to wear leggings as pants and to adorn them with strong jewelry choices. Teens in the 1980s often paired leggings with bold, curly hair for a complete style. While we may now scoff at wearing shoulder pads, this form-building cushion was popular in many silhouettes of the time. The padding helped to develop more boxy styles that paired well with other trends like jean jackets and sweaters that let the shoulder peak out. It was also a popular style to wear in many more formal work ensembles, like those a teen might wear to work only to come home and wear it out with friends. Boys had their own distinct style as well beyond their love for denim and neon. Not only did t-shirts reign supreme but jackets and sneakers were also distinct. 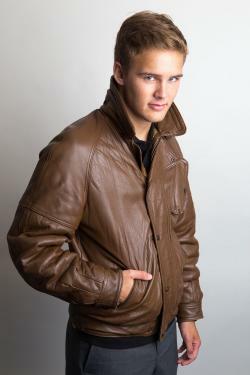 A must-have for a guy in the 80s was a Bomber jacket over a white t-shirt. Could you get any more Top Gun? If they weren't wearing a bomber jacket, guys of the 80s might don a leather jacket or windbreaker. Sweaters might also be worn if you were going for that slightly preppy look. Your sneakers need to make a statement. Whether they are high tops or low tops, white was the color of choice of teen boys in the 80s. Pair these with a pair of stonewashed, pegged jeans and you were ready to hit the town. And you couldn't go wrong with a pair of Converse. If you were a fan of Miami Vice, then you couldn't go wrong with a white suit like Crockett. Pair this with a bright shirt and a pair of slamming shades and you were a hit. But the look wasn't complete without a pair of loafers. Whether you were preppy or just too cool for school, this look worked for many 80s boys. As time changes, fashion develops. Styles come, styles go. Fads rise and then die really quickly. While the 1980s saw the height of numerous fads, those fads have lasted as being a part of the decade and have become a serious part of our fashion lexicon.